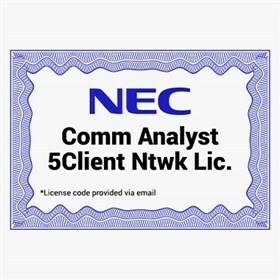 The NEC 1101112 is a Comm Analyst 5 Client Network License. This license provides concurrent user access for 5 additional PCs on the customer’s LAN. Must be used in conjunction with the CA 20-Station License (1101109) or the CA Full System License (1101110). The Comm Analyst 5 Client Network License has many exciting features for users of all types. The Comm Analyst 5 Client Network License is sold as a Brand New Unopened Item.